Turbosmart has designed a brand new Internal Wastegate Actuator for the Mustang EcoBoost, which can help owners get more performance out of their engine with little effort. Turbosmart's 7psi Internal Wastegate Actuator creates a flatter boost curve which comes on sooner, with more stable boost and less drop off at the end of the rev range compared to the stock actuator. The result is a more driveable car with smoother power delivery and less turbo lag. This actuator is for stock to mildly modified vehicles. There will be zero to approx 1psi of peak boost increase. The real performance benefit is in the increased power and torque in the lower rpm's through the midrange (where you generally spend most of your time). With Team Z's 2015-2018 S550 Mustang Bumpsteer kit you can correct the steering geometry of your lowered mustang. The MRT Down-pipe designed for the 2015 EcoBoost Mustang will provide you with horsepower and torque gains, an increase in fuel economy as well as additional depth to your Mustangs exhaust note! Engineered by MRT to take the place of the OE catalyst and intermediate tube, this down-pipe is a direct bolt-in upgrade, requiring no cutting or welding to install. The MRT Down-pipe frees up as much back-pressure as possible, without having to replace the entire cat-back. Meaning will notice performance gains without losing the mild tone of the stock mufflers and mid-pipe. The Off-road option replaces the factory down-pipe and catalytic converter with a strait through 3" 304ss exhaust pipe for optimum horsepower, torque, and quality. MRT's CNC mandrel bending technology ensures that all MRT exhaust systems have smooth bends and precise fit. MRT manufactures all of our exhaust out of the highest grade 304 Stainless Steel right here in the USA at the MRT Headquarters. We stand behind the quality of our exhaust systems with an industry leading LIMITED LIFETIME WARRANTY! This MRT Down-pipe requires no modifications to your 2015 EcoBoost Mustang, meaning this is a direct bolt-on part. MRT recommends a custom calibration whenever replacing the factory catalyst pipe to optimize performance. 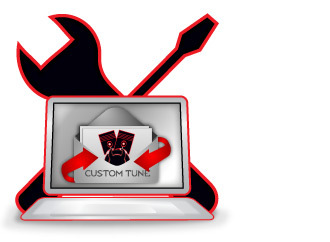 MRT can provide custom tuning that will greatly improve the performance of your Mustang. Please call MRT for more information at (734) 455-5807. Note: All MRT Exhaust systems are designed for Off-Road use only. AIRAID MXP Series Cold Air Dam Intake System: The AIRAID MXP Series represents the ultimate in Cold Air Induction systems. Designed for high-performance gas and diesel applications, the MXP Intakes start with a new one piece roto-molded air box that addresses all the shortcomings of the restrictive factory design. Then AIRAID® adds a new air intake tube constructed of cross-linked, high-density Polyethylene that is designed using extensive computer modeling to maintain proper mass air flow readings and calibration. They also frequently have a built-in velocity stack, which further promotes airflow. What this all means is a simple-to-install system that was designed using extremely sophisticated technology to increase airflow while maintaining proper air / fuel ratios, therefore eliminating the need for re-calibration once installation is complete. Just bolt it on and go! Like any other AIRAID® Intake System, the MXP includes an AIRAID® Premium Filter that is sized to maximize power and efficiency. Injen has released its Evolution Air Induction System for the 2015+ Ford Mustang EcoBoost. The Evolution Air Induction System is durable, fully enclosed and utilizes a rotational molded induction system. The Evolution Air Induction System is 100% CAD designed for an easy and seamless install. This kit comes complete with a built-in filter minder for easy filter maintenance. The EVO9200 utilizes the biggest SuperNano-Web dry filter and is dyno-tuned for maximum power and no check engine lights. In dyno testing Injen saw gains of up to 23 hp and 21 ft/lbs torque. Dyno-tuned as a system for guaranteed safe horsepower and torque gains. Research yielded gains of 23 hp and 21 ft/lbs torque! SCT X4 Power Flash Programmer: From the factory, your vehicle's computer is calibrated for the masses, designed with the average driver in mind, not the performance enthusiast. This not only leaves valuable Horsepower & Torque hidden inside your vehicle, but it also makes for a mediocre driving experience. The SCT X4 Power Flash unlocks your vehicle’s hidden performance by optimizing your vehicle’s computer for Maximum Horsepower, Torque, Increased Throttle Response, Firmer Shifts & even Increased Fuel Mileage! * Adds Horsepower & Torque in Minutes! SCT’s Performance & Towing tune files not only optimize the vehicle for Maximum Performance, they often INCREASE the vehicle's FUEL MILEAGE by up to 1-2MPG! Since 2000, DiabloSport has been a major part of the Ford performance world. From our original performance chips, to the Predator, and then inTune, our expertise in Ford tuning means that by simply installing the i2 programmer on your car or truck, we guarantee huge power gains. We have been tuning the Mustang, Powerstroke and F150 longer than just about anybody- and the driving experience you will get from the i2 tuner will prove it. Our new inTune i2 allows for a first at DiabloSport– you can now tune more than one vehicle at a time by purchasing a tuning license. If you have the i2020 for your 2015 Mustang, but you also want to tune your 2014 F150, you can get a license that lets you to tune both at the same time! CUSTOM TUNING VIA MAIL ORDER, DYNO SHOPS, OR DIY! If you have popular performance mods on your Mustang or F150 like cold air intakes, exhaust, heads, cams, or even superchargers, the i2 gives you options to take control of your tune. Whether you want to tweak the tune yourself, or bring it to a professional tuner, the i2 has you covered no matter how aggressive your build is! 2015 Ford Mustang Ecoboost Downpipe - Increase performance and improve sound with our Ford Mustang Ecoboost Downpipe. Our 2015 Mustang downpipe is designed with a 3" diameter and is TIG welded. Get superior performance with a lifetime guarantee with Stainless Works. Available with a variety of options: Choose from our high-flow catalytic converter or off-road lead. Also choose your connection point: Factory Connect easily mates to the factory connection point (to the factory exhaust), or Performance Connect, to pair with Stainless Works 2015 Ford Mustang Ecoboost exhaust, for optimal performance and sound enhancement. For the first time in over 30 years, the iconic Ford Mustang is available with a turbocharged 4-cylinder engine producing over 300 horsepower in the form of the 2.3L Mustang EcoBoost! Turbocharged 4-cylinder engines produce extremely hot charge air temperatures very quickly, and the stock tube-and-fin EcoBoost intercooler can also suffer from heat soak after a short time. To help offset these high temps, Mishimoto is proud to introduce a line of performance EcoBoost Mustang parts, including a highly efficient bar-and-plate intercooler. This Mustang EcoBoost intercooler is a direct-fit unit that requires no modification to your 2015 Mustang. The engineers at Mishimoto designed the EcoBoost Mustang intercooler to fit with the stock active grille shutters, as well as prevent airflow blockage to the radiator and AC condenser by mounting it in the stock location. The cooler is constructed with cast end tanks that are CFD-tested for maximum airflow. This EcoBoost intercooler also includes an in-tank air diverter on the hot side to provide optimal flow through the core. The Mustang EcoBoost Intercooler reduces intake temperatures by 35°F (19.45°C) with minimal pressure loss, has a 25% increase in core volume, and a 165% increase in external fin surface area, providing maximum cooling for your pony. The EcoBoost Mustang intercooler features precision TIG-welding and is available with a Sleek Silver or Stealth Black finish. The 2015 EcoBoost intercooler mates perfectly with the Mishimoto 2015 EcoBoost intercooler pipe kit. As with all our 2015 Mustang parts, the Mishimoto Mustang EcoBoost Intercooler includes the Mishimoto Lifetime Warranty. Pump up the volume of your 2015 Mustang EcoBoost exhaust! The utilization of twin oval mufflers and larger diameter piping makes for a nice increase in volume and tone without any increased drone. The full 304 stainless steel, mandrel-bent construction provides optimal flow to free up some power in that 4 cylinder turbo engine. The engineering team went through a few different tip designs before settling on these classic oval mufflers that provide a sweet tone with no added drone. The dual 4.5" double wall polished tips will be sure to give your opponent a nice view at the local drag strip. If you want the best in exhaust performance, pair this EcoBoost exhaust with the Mishimoto EcoBoost Downpipe. The Mishimoto Ecoboost Mustang exhaust fits both manual and automatic transmission vehicles, and just like all Mishimoto Mustang EcoBoost parts, comes with the Mishimoto Lifetime Warranty.